Woolf is known for her modernist novels, most notably Mrs. Dalloway and To the Lighthouse. In all of her work, she employs painterly as well as literary techniques in her portraits and metaphors. The character of Lily Briscoe in To the Lighthouse is a painter whose creative efforts are at the core of the novel. 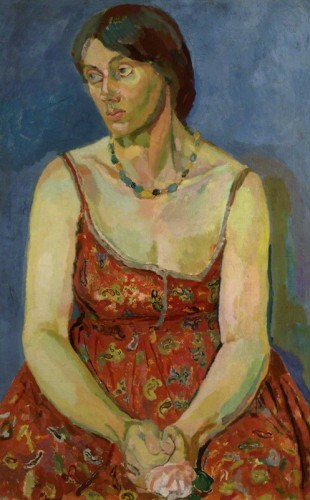 Woolf had an avid appreciation of visual art and was steeped in it. Her milieu was the famous, or infamous, Bloomsbury Circle of early twentieth century London. 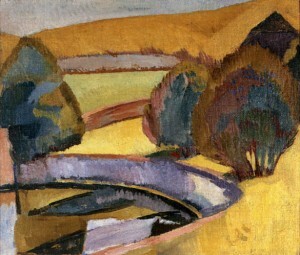 Among the key figures of Bloomsbury, along with other writers and a token economist (John Maynard Keynes) were three notable English post-impressionist painters: Woolf’s sister Vanessa Bell, her partner Duncan Grant, and their mentor Roger Fry. The group had frequent philosophical and critical discussions about each others’ work and about the arts. Visit Virginia Woolf’s house! Click here if you are unable to view the video. I’m not the least bit “afraid of Art”, however I might very well be afraid of Virginia Woolf. Fifty nine is a pitiable number of years for such a gifted/tortured author. Thanks for pointing her out. Always learn from your blog. Like its brevity, as well as links. As an avid literature lover, the current blog about Virginia Woolf, was particularly interesting. Thanks, Kirby (and thanks Lydia)! Sooo interesting! 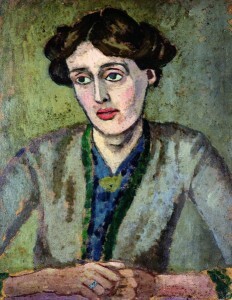 Had no idea Virginia Woolf’s sister was an artist. Her sister looks pretty depressed too. Wonder if it ran in the family. So sad. . . such a waste. Musicians and perhaps composers especially can feel this tug from the visual arts. There is often imagery in mind as we create. Cheers and thanks! Hey everybody! Alice Lowe is an accomplished writer focusing on Virginia Wolf. Well worth reading!